What Works? 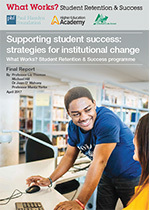 Student Retention & Success is a Paul Hamlyn Foundation initiative working with the Higher Education Academy, Action on Access and thirteen UK universities. This initiative focuses on the identification, evaluation and dissemination of good practice, specifically in relation to the retention of students within the HE sector. 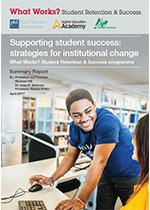 Through engaging and supporting universities in better understanding their practice around retention, this initiative has provided instructive evidence, learning and recommendations to improve the quality of retention work in HE institutions. A total of £1 million was awarded over three years from September 2008 to fund a number of projects that aimed to generate robust, evidence-based analysis and evaluation and ensure effective sector-wide dissemination of learning about the most effective strategies to ensure high retention and completion rates. Findings from phase one were published in summary form in March 2012, and in full in July 2012. Use the links on the right to read more. Findings from phase two were published in April 2017. Use the links on the right to read the summary report and full report. Reports and case studies from individual institutions can be found below. Not all institutions chose to publish their reports. The What Works? 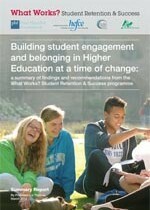 initiative published its final research report 'Building student engagement and belonging in Higher Education at a time of change' in July 2012.